Who’d a thunk it? Did you know that you can purchase lottery tickets with a credit card? I was at an acre-large Italian grocery store in Woodbridge the other day. I wanted a bucket of wild mushrooms in oil (the oil is tasty in salad dressings and the fungi mixture that includes whole cloves of garlic, hot peppers, onions and rosemary) and another of sun-dried tomatoes packed in oil. I know, I know. Oil is the enemy. 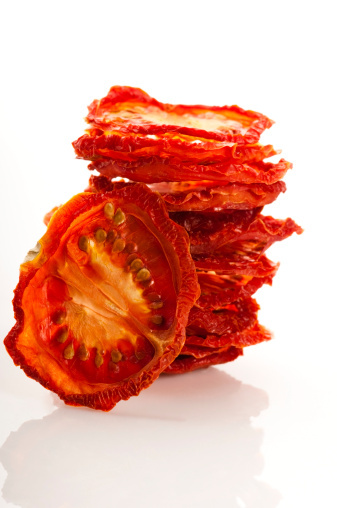 But the Italian Marzano dried tomatoes are so luscious and soft, you can clip them with a pair of kitchen shears. They’re delicious tossed with some fresh cooked pasta, sauteed garlic, some pesto, ground pepper, chopped red onion and a splash of whipping cream. No meat, just salad or stemed broccoli as a side dish. I have half a bag of the plain dried stuff already chopped, but when I reconstitute them in water or broth, they just don’t pack the same flavour wallop as those wrinkled ruby orbs in olive oil. When I get the thermostat unit in my Bradley smoker replaced, I’m going to smoke some of the for extra pizazz in salad dressings. Here’s a recipe that includes garlic, basil and olive oil – a wonderful combination for anything green. Anyhow, on the way out, my eye caught the notice that said the lottery draw prize was $50 million. I said to myself, if you win one quarter of that, even one fifth, that’s still $10 million. I could make good use of that. Pay bills, of course. Mine and everyone else in my family. Buy my children and adult grandchildren houses for cash. Buy Hub the antique MG he has his eye on. Perhaps a cottage, some property in a warm southern country. A chef to cook all of those healthy low calorie tasty meals that I crave. A garden guy to do all of the heavy lifting. Someone to do the laundry, fold it and iron it. Throw lots of amazing parties. There’s still be a lot of money left, so I’d give to my friends, to charities that help the poor by building fresh water wells, schools and hospitals. Travel whenever we want, wherever we want, in first class. I visualize. I use my imagination to select the winning numbers. I alternate with Quick-Picks just in case karma is smiling on me and my numbers come up from the cosmos. With that kind of moolah in the bank, I’d be oh-so-keen to help the economies of any number of countries. Nothing yet. But I live in hope.